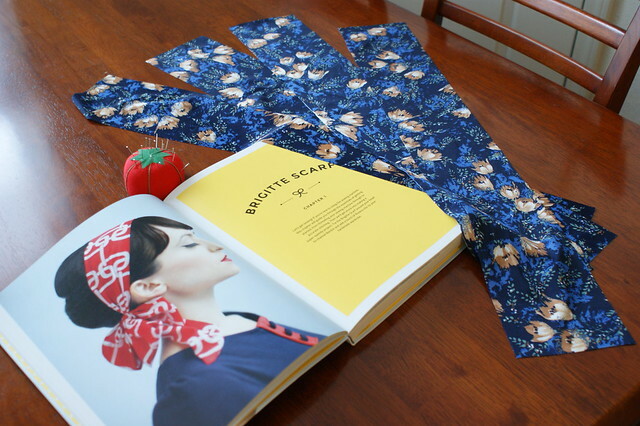 Back in November I made a dress from my vintage stash using this pattern. It’s the Simplicity 8541 from back in 1969…I could have submitted it for the 2014 vintage pledge but I didn’t. This was my first time using a polyester knit for a garment and it just didn’t go smoothly. 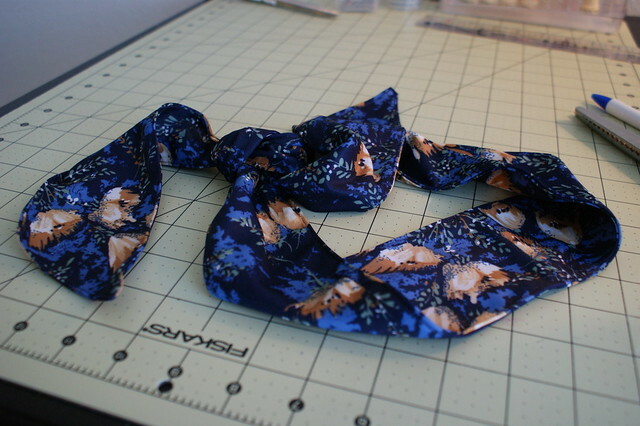 I couldn’t get the collar to sit right, the pleat had disappeared and it was too tight. It was put into the cupboard and forgotten about. However, I got it out to try on earlier this week as I wanted to use the left over material for something else I had in mind. I put it on and then wondered what I had been fussing about when I made it. The collar isn’t a disaster, it’s ok and it wasn’t as tight as I remembered it being! So here I am today, blogging about it! 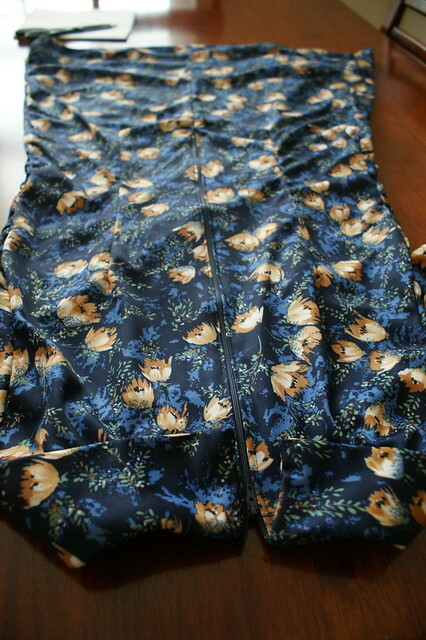 I made a straight cut size 12 as the Simplicity 12 I had made before had been too big. The length of this dress has been measured for 6ft models though. I am not 6ft, so I ended up snipping about 6 inches from the bottom of the dress. I didn’t think about it at the time and I should have done, but as I had shortened the length, I had also managed to make the front pleat disappear. I should have really shortened it in the body but hey ho! 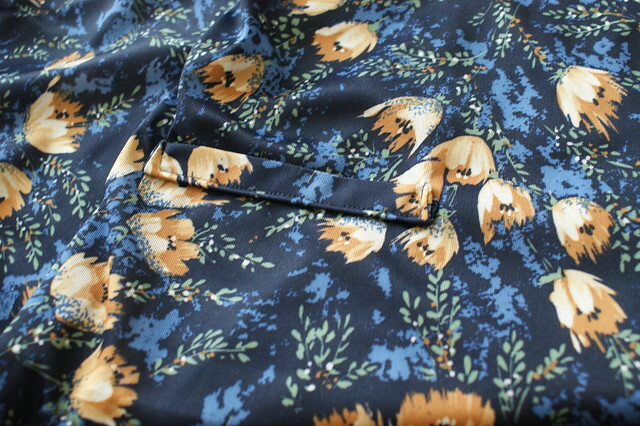 The pattern added these little false pockets, which if I was to make this dress again I would definitely make these real pockets or have them in a contrasting material. I think they get lost a little in the print of this fabric. The zip was really long but surprisingly easy to insert. 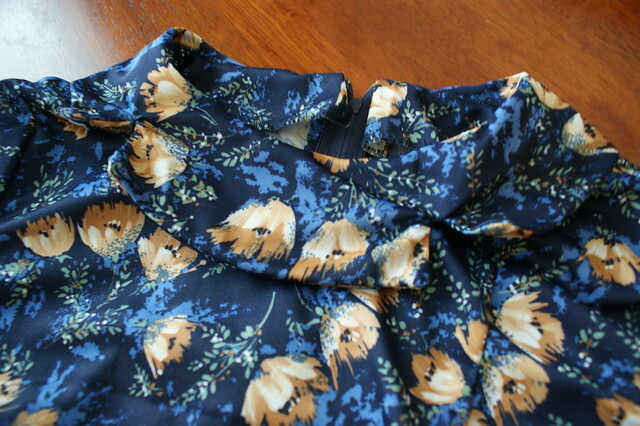 Despite the cover of the pattern stating that the dress is ‘easy cut, easy sew‘, the collar was just a nightmare. 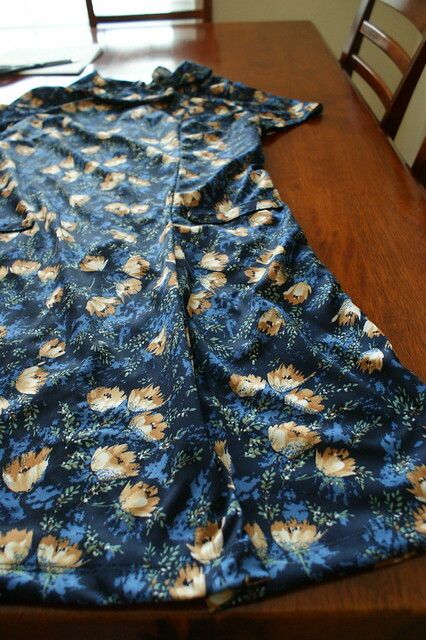 I think it would probably be better with a different fabric, maybe something firmer. 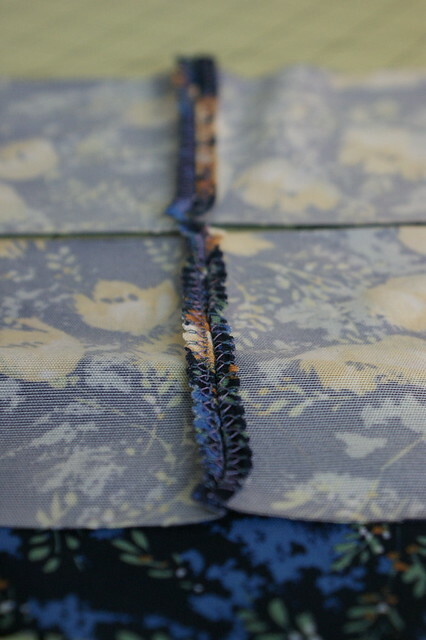 The fabric kept moving which made the curves even harder to cut and when I had managed to get my head around sewing it together, it ended up being all puckered. 😦 It wouldn’t press down either but it was at this time I had already decided that I just wanted to get it finished so I didn’t bother unpicking it all! Like I said earlier, it just went into the cupboard. 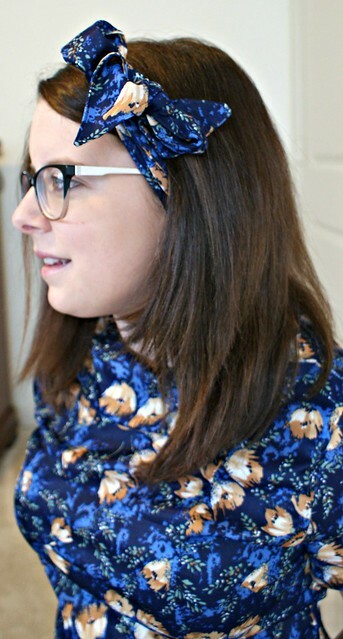 The dress came back out again though when I decided the make the Brigitte head scarf from Tilly’s book Love At First Stitch. After spending too much time deciding what my next project would be from this book or Gertie’s book, I decided to start at the beginning of Tilly’s…which is a very good place to start! As I was using the scraps of material left over from the dress, I actually ended up cutting 4 separate pieces and stitching them together. 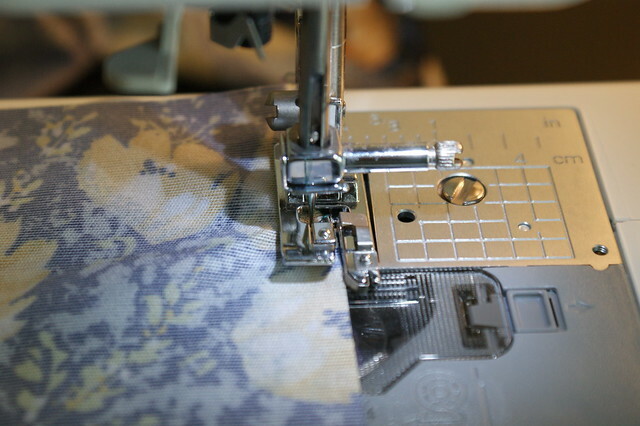 I am trying to make garments that will last so I did a simple overlock stitch, with a different foot, on all raw edges. I have already had a seam accident with a top I made but didn’t finish the edges on. I’m learning from my mistakes! One of my goals for this year is to try and use what I have in my stash, including thread. 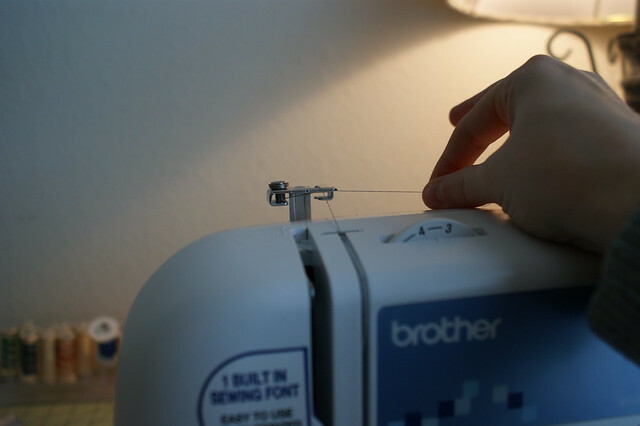 I used this thread right until the last inch but had to substitute my hand for machine parts. Notice the adjusted tension on this photo too. I actually spent time on a scrap piece of material getting it perfect! That is certainly not something I have done in the past. There we go…finished! I love it! AND it matches the dress perfectly! Lovely dress! and it looks very comfortable. Yes, it was very long! I know that I need to measure the length of the pattern before I cut it next time! Great dress, despite its tantrums 🙂 Looks great with the matching scarf. I’m really glad that I went back to it 🙂 It has now made it into my ‘everyday dresses’ section of the wardrobe! So, so cute Natalie! I love the fabric! Pingback: Talented Tuesday Link Party #12 - Cook. Craft. Love.